Like many people I have dreamed of my wedding day since I was a little girl. I dreamed of having the most beautiful dress, a perfect wedding venue, and the man of my dreams by my side. When that man asked me to marry him I was full of happiness and excitement. My only worry was that I was not in great shape and I would not look my best on my wedding day. I made the decision to join Fit 2 the Core/Nutritionworks. I could see the changes immediately. I was becoming stronger and more confident every day. With my wedding day as my goal I continue to work hard. 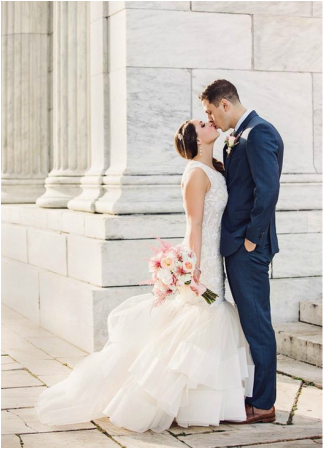 It wasn't until a few months in that I realized that I wasn't only coming to the gym to look good on my wedding day, I was coming to the gym to create and maintain a healthy lifestyle for myself. I loved looking good, not for anyone else but me. Now with my wedding day in the past, I continue to push myself and work hard at the gym multiple times a week. I enjoy working out and I never had before. I do so because Fit 2 the Core/Nutritionworks, Camille, Dawn and the other clients have help me make a lifestyle change that I will forever continue. Since Lauren started at Fit 2 the Core, she has lost 8.6lbs, has decreased her body fat percentage by 3% and has decreased her fat mass by 6.6lbs! !